When you compile a “best of” book from a neighborhood newspaper that’s outstanding to begin with, you’re bound to get an impressive result. 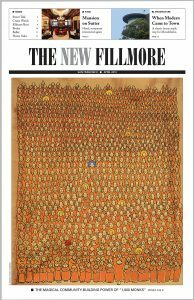 Our Town: Best of the New Fillmore packs into one volume the New Fillmore’s shiniest nuggets, and the stunning final product leaves even a longtime resident like me feeling she never really knew the place. It might seem an overwhelming task to capture the rich layers of history concentrated in this neighborhood, but this elegant, oversized volume covers it all nimbly and compellingly with first person stories, rare vintage photographs and striking modern images. 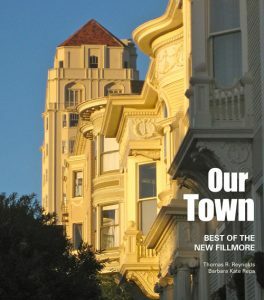 Vanished eras come alive: the day electricity came to the street; the dark time leading up to World War II when the neighborhood’s Japanese citizens were taken from their homes and put in internment camps; the years when redevelopment leveled whole blocks and wiped out the Fillmore’s vibrant African American community. Here are Bill Graham’s Winterland stories, and the saga of the rise of the Peoples Temple cult that ultimately led to the Jonestown tragedy in Guyana. The Fillmore neighborhood was a root-place for so much that shaped culture through the decades, and this book does a masterful job of embracing it all: Etta James ran through these streets in a girl gang. Carlos Santana’s studio was here. In an apartment above Fillmore Street the artist Jay DeFeo created a painting deemed one of the 10 greatest of the 20th century. Just around the corner was the studio of the photographer Ruth Bernhard. 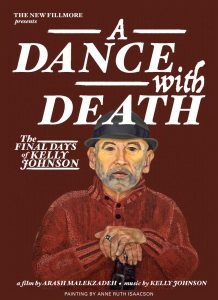 Much of the power of the book comes from its first person stories: You’ll hear from the local landlord who rented an apartment to the Black Panthers and from the Beat poet who describes what it was like to read at Minnie’s Can Do Club in the ’60s. The authors have captured and preserved the essence of this place, with all its eccentricity and complexity. I was swept into another world as I read it, a magical place I couldn’t pull myself out of for days after I put the book down. Nora Jackson is a historical novelist and a longtime neighborhood resident. OUR TOWN: Best of the New Fillmore is available at Browser Books on Fillmore Street or by mail from Norfolk Press.